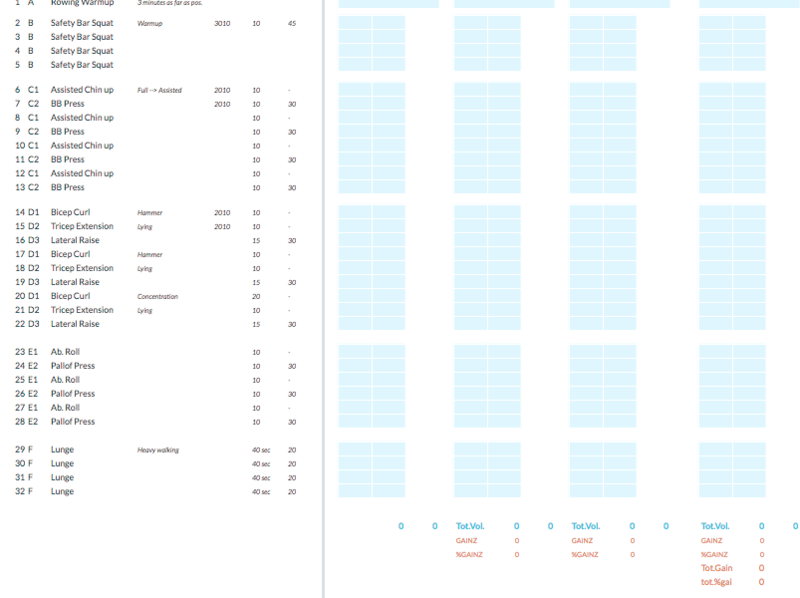 Designing the ideal training program is no simple task. There are many variables at play, and due to our body’s incredible ability to adapt to whatever we throw at it, we have to constantly adapt these programs to keep our body’s wanting to increasing our muscle mass. This is one of the most important principles in programming, progressive overload. 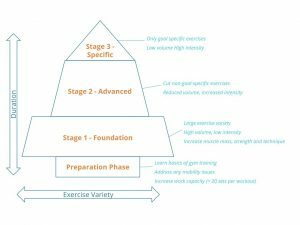 Although no two clients will have the exact same program, the process we use for structuring your workouts is similar, and can roughly be broken down into 4 stages: (1) Preparation; (2) Foundations; (3) Advanced; and (4) Specific. Each of these phases have different aims and objectives, while the individual timeframes for the complete cycle or individual stages will also vary depending on client and goal. 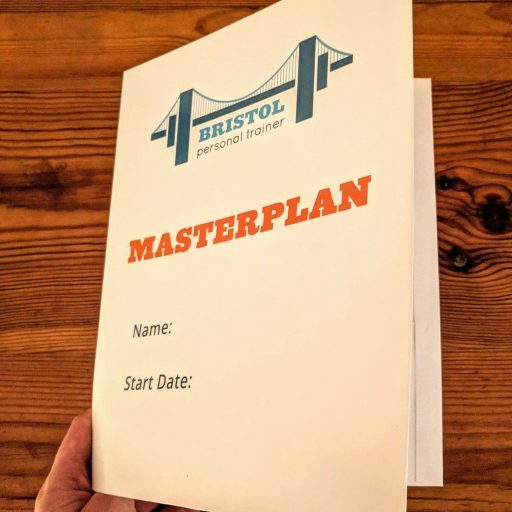 A competent gym-goer looking to prepare for his first powerlifting competition next year could have a 12 month cycle, spending only 1 week in the preparation phase, 4 months in the foundation phase, 5 months in the advanced phase and 3 months in the specific phase. Whereas a gym-novice looking to lose weight and tone up for holiday in 3 months time may have a 12 week cycle, with 4 weeks spent in the preparation phase, 4 weeks in the foundation phase, 2 weeks in the advanced phase and 2 weeks in the specific phase. The first stage introduces gym training. Essentially learning to walk before we run. Obviously this is going to be longer/shorter depending on how experienced someone is. Generally in this phase we are looking to establish the basics of gym training, focusing on learning the key movements and fixing or working around any issues that may prevent these movements. A typical program in this stage simply splits the hour long session into 6-10 minute chunks focusing on different exercises for each of these movement. Experienced lifters may only need 1 week in the preparation phase, whereas complete-novices may need 4-6 weeks preparation before starting first proper program. Generally we are looking to ensure each trainee has the basic techniques nailed down and a large enough work capacity (comfortable with > 20 sets per workout) to handle first phase of proper programs. 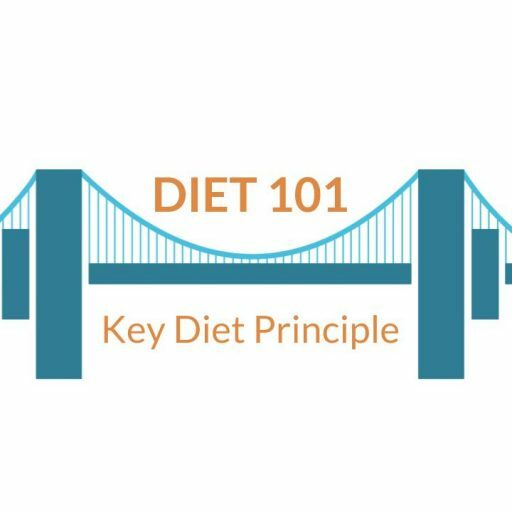 Once a client has passed the preparation phase, they go straight into their first proper program. Rather than the ad-hoc sessions, now we have a good idea of what exercises are best for you and the weight and workload you can handle, this stage introduces more structured routine, and enables more in depth progress tracking and progressive overload. The objective of this program is to build a solid foundation of muscle, strength and technique across a large range of exercises that will form the backbone of the more specific and advanced programs in the future. So although this program and exercises will differ person to person depending on the information gathered during the preparation phase, they are generally full body programs, with a broad selection of exercises, and a focus on high volume and lower intensity (more reps less weight). During these programs, the main variables changed to ensure progressive overload are reps and weight. Now that you have your first program under your belt, you should already be getting some pretty good results, and it’s time to play about with some more advanced training styles. This phase is the broadest reaching, incorporating many possible training approaches. Generally speaking this phase starts to cut out a few of the less goal-specific exercises from the foundation phase and focuses on the smaller range of movements with a greater intensity (more weight, speed etc.). There are many ways this can be achieved, from strength circuits to pyramid sets. It’s not uncommon for clients to have multiple programs within this phase before moving onto the final phase in the leadup to their goal. The final stage is the last sprint in the build up to your goal. Again these phases will vary significantly depending on your goal, but generally focus on cutting out all but the most essential exercises, reducing the volume and ramping up the intensity. So if you’re building up to your olympic lifting competition, this phase would just be the lifts you will be competing in. Whereas if your goal is getting beach-body ready for your holiday, this is when you may have a final blast at getting cut to peak just before you leave. Once you’ve finished your cycle, you should be in prime condition to smash whatever your starting goals were, be it winning your competition, starting your season in prime condition, hitting your new personal bests, looking your best in your holiday photos or fitting back into your old clothes. Then if you want to set the bar even higher, you can reassess your goals and go through the whole process again!